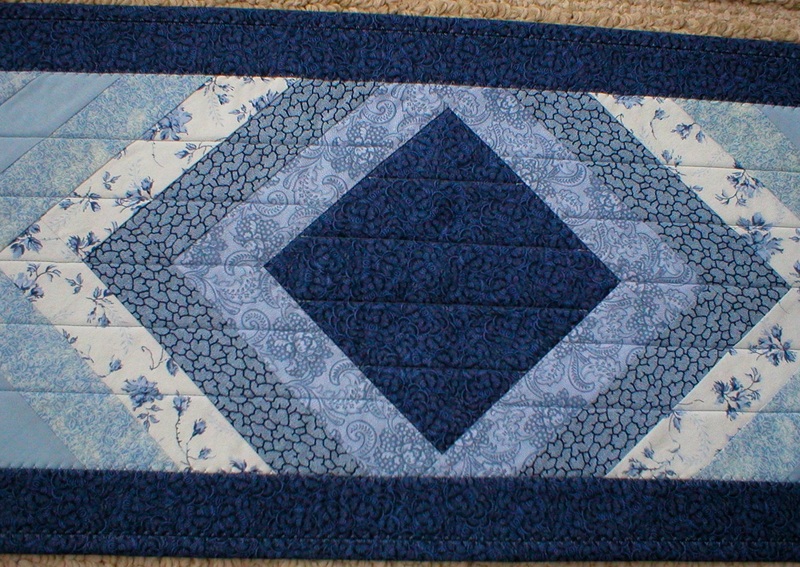 This classy handmade quilted table runner is my latest creation. 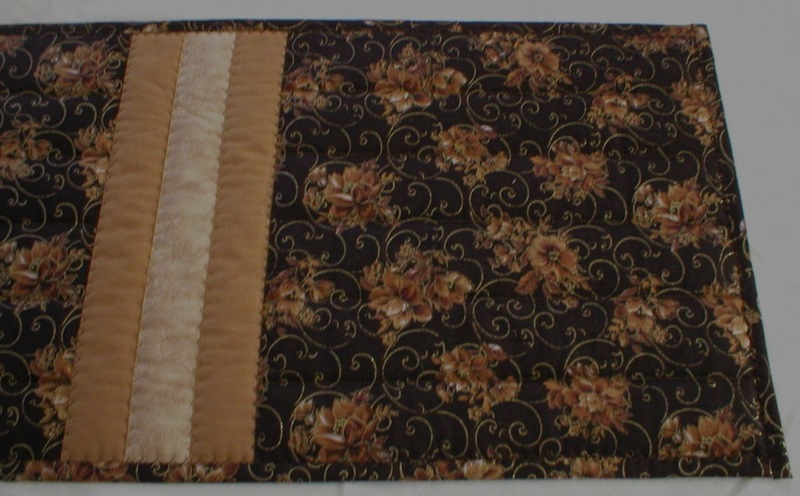 The fabric is truly elegant. 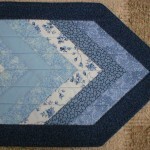 Any time I make a runner with this fabric, it’s snatched up quickly! 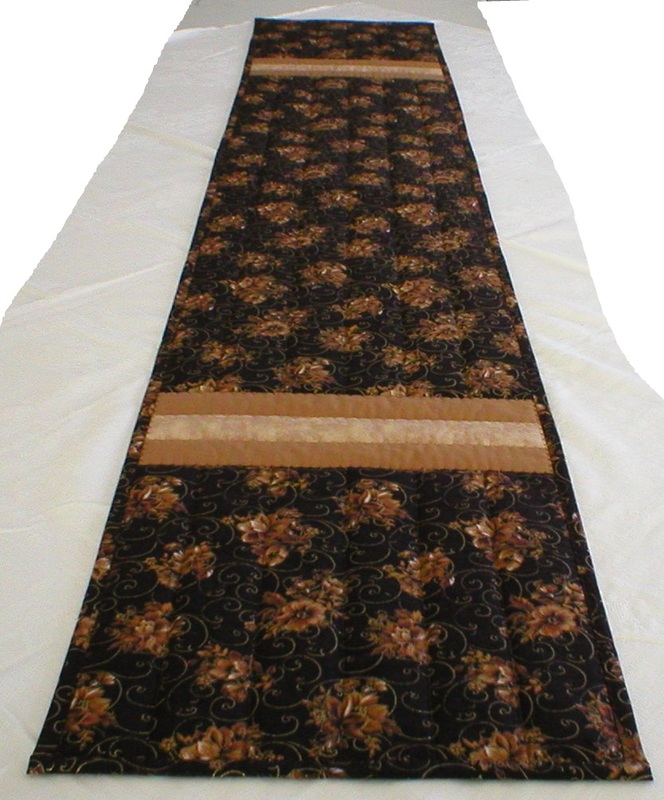 It features dark chocolate cotton fabric with a gold tone floral print embellished with gold thread filigree. 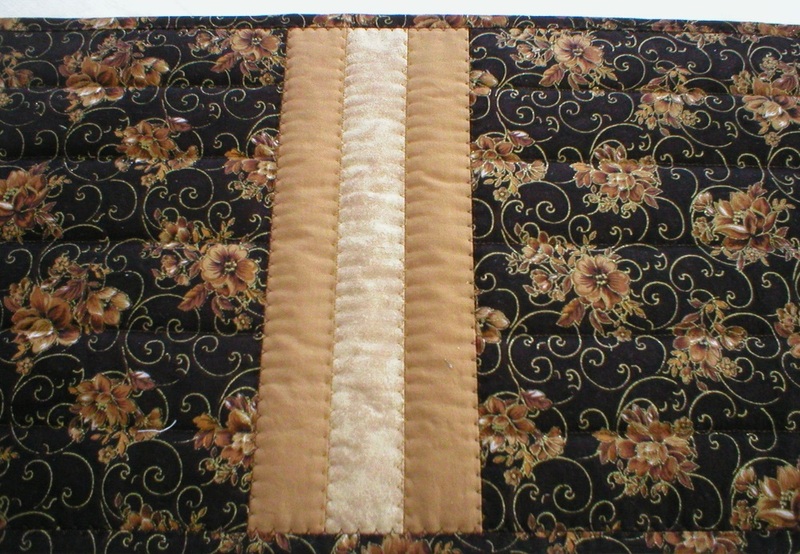 It has caramel and beige coordinating stripes toward each end piece. 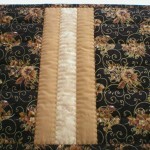 It was machine stitched with decorative stitching reinforcing all seams for stability and endurance. 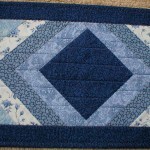 It’s a one-of-a-kind item! 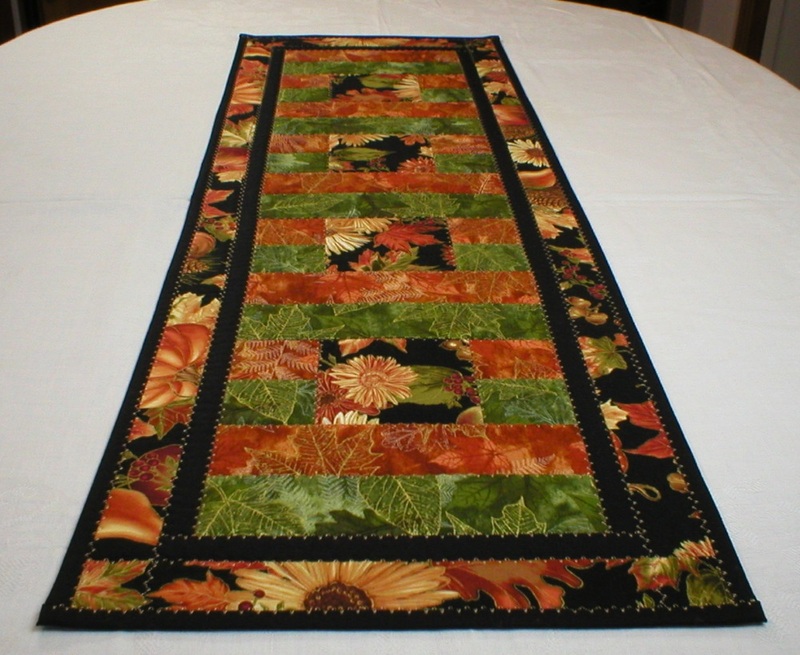 This beautiful runner is 12-1/2″ x 71-3/4″ long. 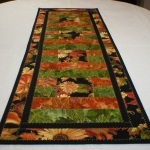 The centerpiece is 39-1/2″ long, with each end piece being 11-1/2″ long. 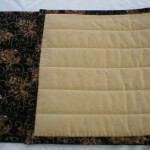 Each stripped area is 4-1/4″ wide. 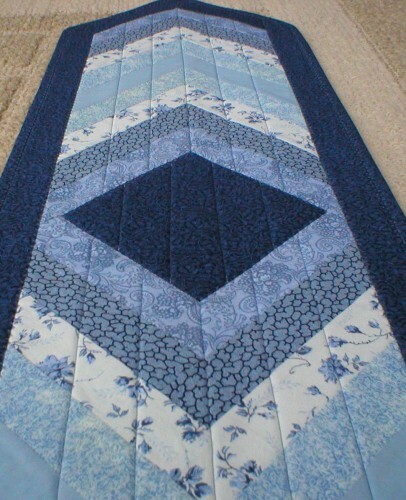 This lovely runner may be machine washed on the gentle cycle with mild detergent and cold water. 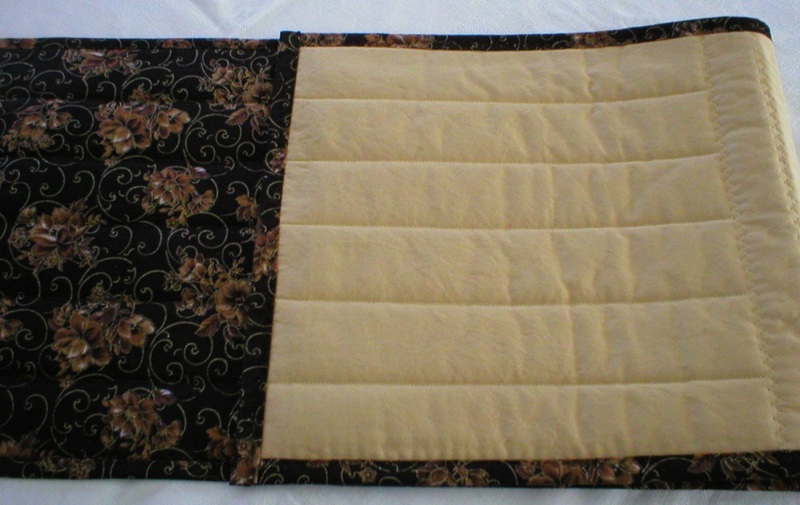 Air or machine dry on low heat. 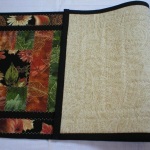 It may be steam pressed if desired (preferably on the backing rather than the top). 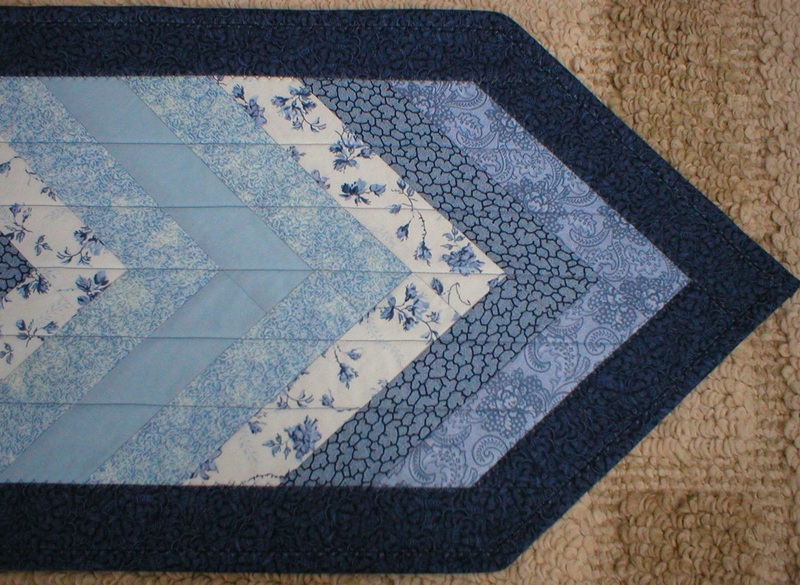 This entry was posted in Quilting and tagged handmade long table runner, handmade quilted table runner, long patchwork table runner, long table runner, quilted table runner, table runner 72 inches long on January 1, 2015 by Judi. 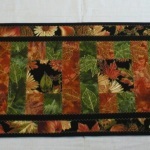 I’m expanding the number of images of my table runners and such on my website. 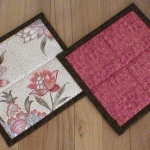 In conjunction with that I’m displaying some of the extra special ones on this blog site. They’re too pretty not to show off! 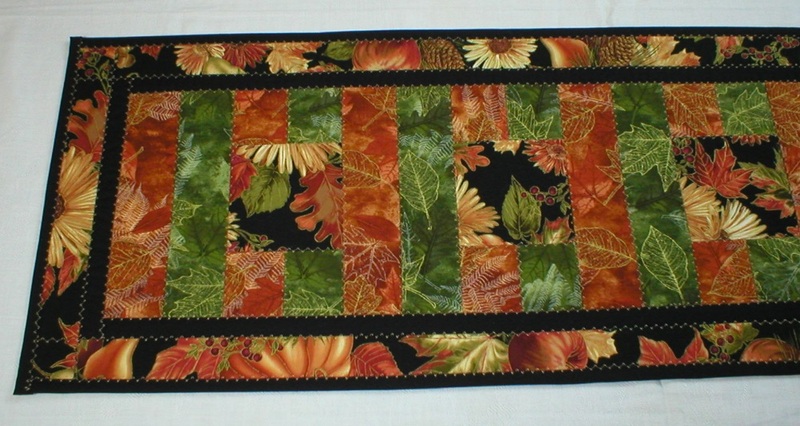 This striking table runner was made with the same fabrics as the runner in a previous blog post. 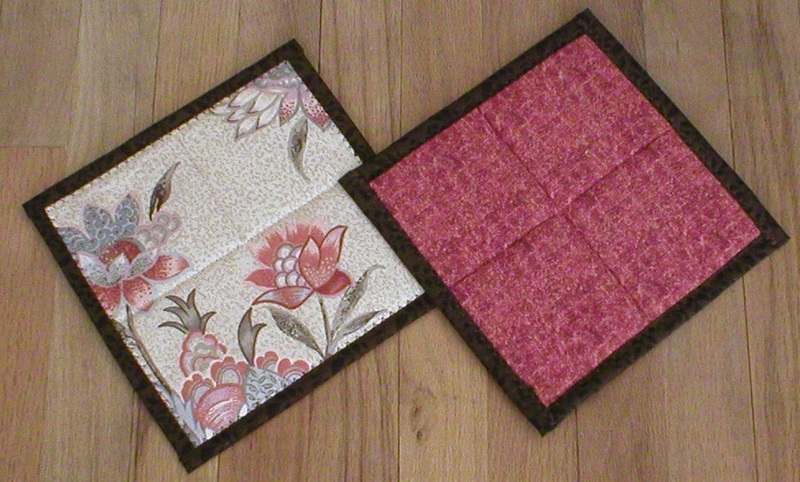 However, the design is completely different. 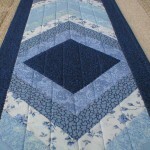 This involved more patchwork than the other. As are my other runners, this is one-of-a-kind! 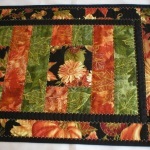 It was made from high quality cotton quilting fabric that is absolutely stunning. 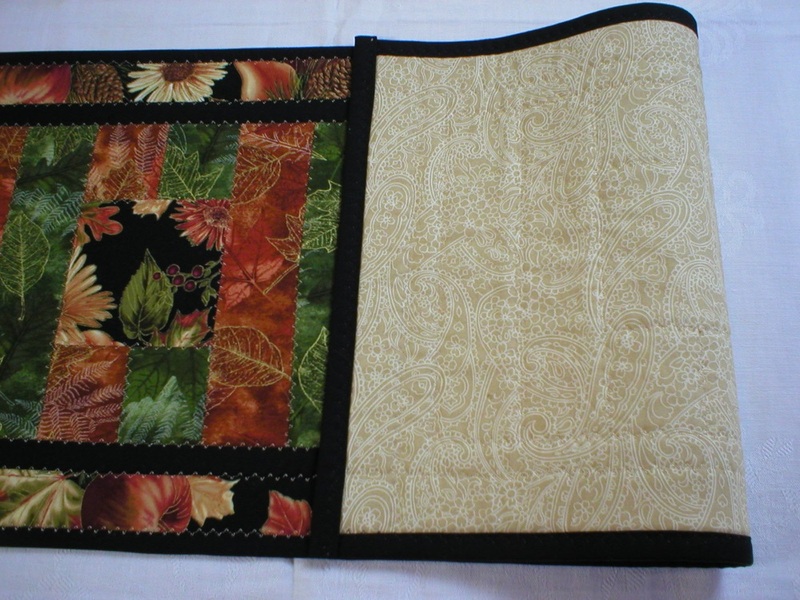 The deep green and rust fabrics have leaf prints adorned with gold threads throughout, as the veins and outlines of the leaves. Really elegant! 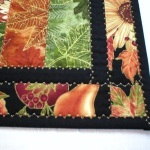 The coordinating fabric has a black background with bold fall flowers, leaves and produce, all with more gold threads. 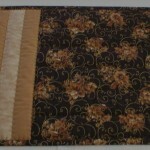 Together they make a brilliant centerpiece for any table, buffet, piano or mantle. 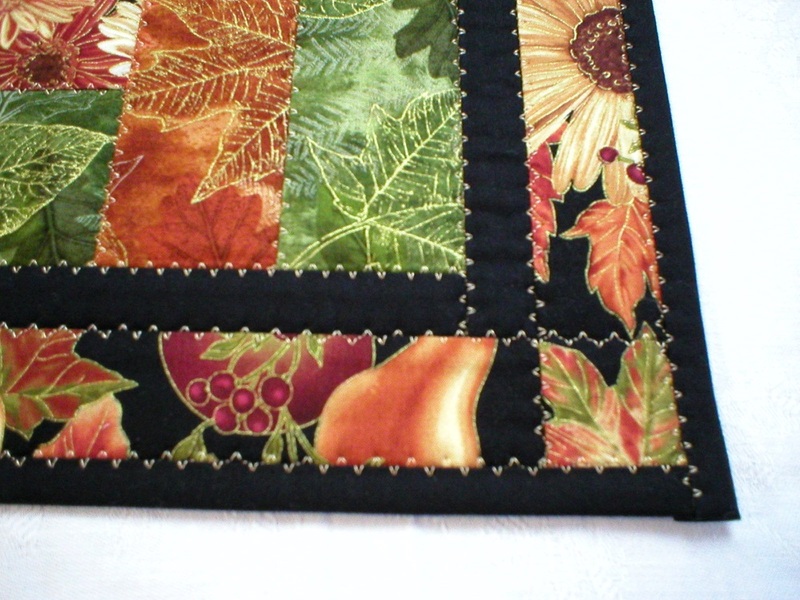 This entry was posted in Quilting and tagged fall harvest table runner, handmade quilted table runner, quilted table runner, table runner 39" long, Thanksgiving table runner on December 16, 2014 by Judi. I’ve been working on boosting my inventory for the holiday season. 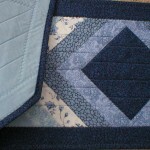 I presented my things at a number of craft shows over the summer and a lot of inventory was adopted. Yea! 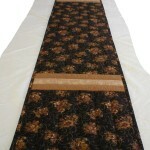 Here is a really pretty “fallish” table runner that captures the seasonal colors of rust, cream and brown. 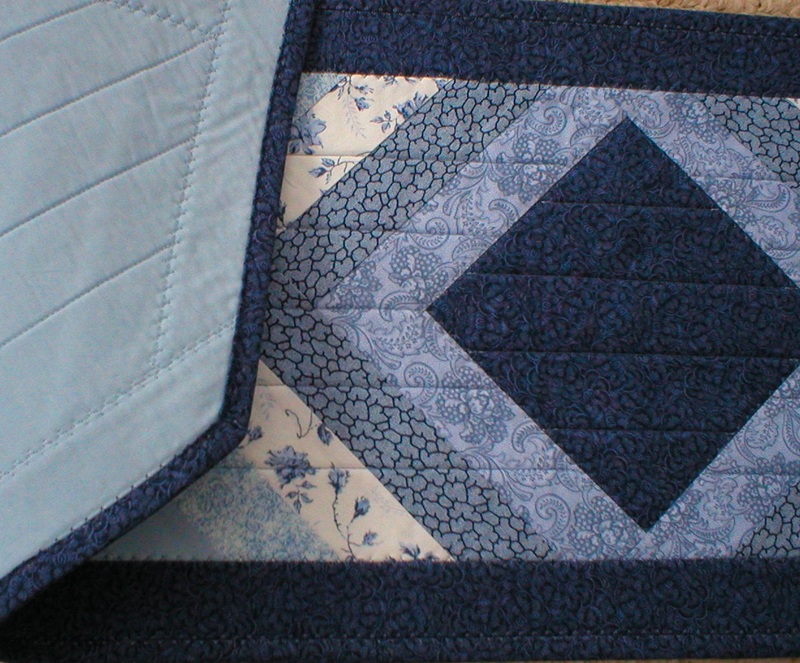 It’s EXTRA THICK with a double layer of batting plus it has flannel as a backing. 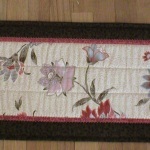 It will certainly provide plenty of protection for your cherished table or even piano top. (Inventory number 31-40-22) Click the thumbnail to see an enlarged picture. 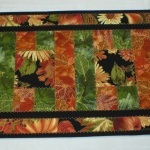 All can be found at my website, HandMadeInIowa.com. 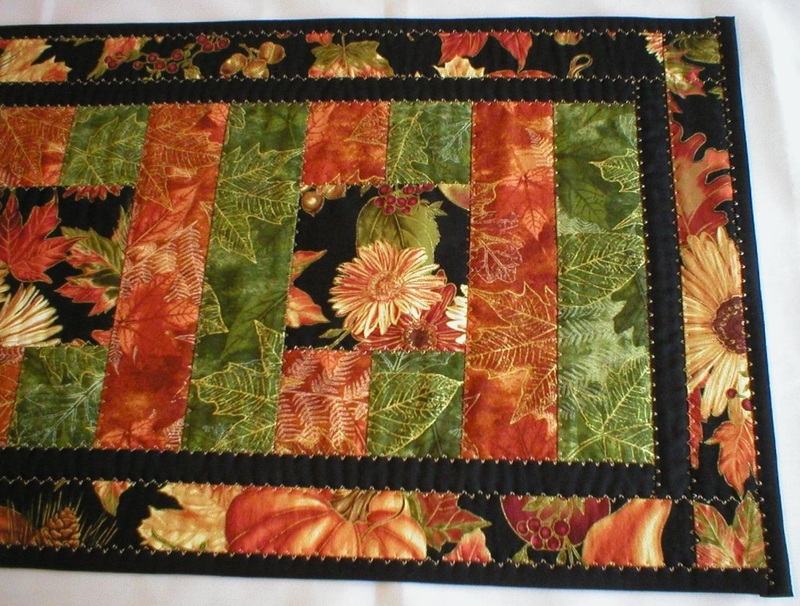 This entry was posted in Quilting and tagged fall quilted table runner, fall quilted table runners, fall table runners, handmade quilted table runner, handmade table runners with matching hot pads, quilted table runner on October 12, 2014 by Judi.